The Safe Storage Unit was originally developed for use by exhibitors at the Chelsea Flower Show to provide a safe place for petty cash, laptop computers, literature, confidential paperwork and other personal valuables that would be at risk on an open stand or which needed safe overnight storage. It is also suitable for domestic use, either fitted inside your home, garage or shed as a compact secure storage unit for smaller valuables, or in temporary situations such as church fetes, school exhibitions or outdoor events. Made from high quality galvanised steel and coated with a tough polyester textured weatherproof coating, protecting against rust for a minimum of 10 years. The Safe is certified by the Loss Prevention Certification Board to LPS 1175 Security Rating 1. Available in Dark Green, Dark Brown, Ivory, Ebony, Blue and Silver Grey. Constructed from 1.2mm thick galvanised steel. The door and door surround are reinforced with 1.6mm thick steel box sections to strengthen the normal forced entry points and resist forced entry. The lock is protected by a 1.6mm thick steel housing. All joints are double folded to increase strength and prevent water ingress. Assembled using 5mm screws through double folds to enable maximum strength of screws to be utilised. The base plinth is reinforced to prevent crushing when heavy objects are rolled over. 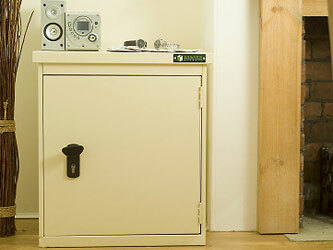 The Safe has a single door, positioned on the front of the unit. The lock side has a 3 point locking mechanism with 10mm thick steel locking bars securing the door at the top and bottom. The door handle and lock set features a handle to set the door bolts and a separate lock to secure the bolts in place. The handle has a pre-set shear point so it will snap off if forced entry is attempted, leaving the unit still locked and your valuables safe.